A young couple goes to a great and tragic lengths to be re-united. A newspaper article describing an amazing journey across the Atlantic Ocean. Two celestial beings discuss the inquisitive nature of man. The author discusses the different presentations of wealth in European and American culture, focusing on the concept of "a well furnished apartment". Egaeus is greatly affected by the burial of his long-suffering cousin. Poe’s character rationalizes his thinking to convince the reader of his sanity and regrets. A wronged pet proves to be a man's undoing. The narrator tells of his life of isolation living with his cousin and aunt. The narrator tells of the circumstances that led to his dramatic change of temperament. Von Kempelen discovers how to turn lead into gold. Fortunato pays the price for insulting the Montressor family name. Hans Pfaal goes to great lengths to escape his creditors. A wealthy man uses his great fortune to create a fantastic landscape. This is a tale of an experiment to hypnotize a man on his death bed. The experiment works—but with horrifying results! Captain Pratt sets off on an adventure circling the globe. The narrator discovers a long-lost Oriental text called Tellmenow Isitsoornot, and is shocked to find the real story of the grand vizier's daughter Scheherazade in Arabian Nights. Then the narrator summarizes what he finds in Isitsoornot. An old friend is summoned to his childhood friend’s home to comfort him during his final days of an illness only to witness strange and horrifying happenings in the House of Usher. The narrator finds it increasingly difficult to conceal an act of violence from the authorities. An unnamed narrator retells Augustus Bedloe's account of his strange experiences in the Ragged Mountains. In this story, a demon recounts the curses he placed on the beauty that surrounded him. While in the presence of death, the characters of the story are confronted by a strange entity. An unnamed narrator tells how a Parisian detective, Auguste Dupin, solves a case of a “purloined letter.” The letter belonged to the Queen, and the man who took it had switched it with a plain letter, and was using the information contained in the stolen letter to blackmail the Queen. The police Prefect wants Dupin to figure out how to catch the man, and Dupin reasons his way through the case, eventually nabbing the thief by using his own technique against him—switching letters back. A letter from the author to Mr. B&mash;. The narrator's strange condition causes him to develop an acute fear. The author discovers and enchanted island of the Fays and witnessess the demise of a Fay. The author presents his opinion on poetry and the ultimate goal of art. Two drunken sailors happen upon a strange scene at the undertaker's shop. About the torments endured by a prisoner of the revived Spanish Inquisition. The author presents his theory on the subject of compositiion. The narrator describes the other worldly nature of Landor's Cottage. The narrator experiences tragedy, but is reunited with his love through an unconventional occurrence. The narrator discovers a shocking painting while seeking refuge in an abandoned mansion. Separated from his family, the narrator sets sail on a cargo ship from Indonesia. The author presents his opinion of English poetry. The plague is sweeping the countryside, so a prince takes many friends into his castle to save them. They live grandly and have a masked ball, but Death comes to the ball and kills everyone anyway. A doctor has a rather unusual conversation with a dying patient. A cursed woman's husband attempts to free her soul. Poe, Edgar Allan. The Works of Edgar Allan Poe. Lit2Go Edition. 1903. Web. 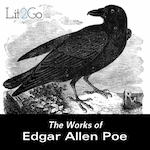 <https://etc.usf.edu/lit2go/147/the-works-of-edgar-allan-poe/>. April 19, 2019. Edgar Allan Poe, The Works of Edgar Allan Poe, Li2Go edition, (1903), accessed April 19, 2019, https://etc.usf.edu/lit2go/147/the-works-of-edgar-allan-poe/.